The face of agriculture, as Northern Californians have known it for decades, has changed forever. Old faces have vanished and new faces have arrived. The days defined by barbed-wire fences, locked gates, crop-dusting, "No Trespassing" signs and a near-medieval state of mind have disappeared. All across Sonoma, Marin, Napa and Mendocino counties, a new generation of artisan farmers and creative ranchers have opened their fields and barns to the public and set out the welcome mat. Pesticides and herbicides that caused cancer have been banned, and the compost pile thrives as never before. Unlike the agriculturalists of old, who prided themselves on producing the biggest crops in the fastest manner, today's quiet agrarians believe that small can be beautiful, that slow and steady makes for good business, and that farmers, environmentalists and consumers share common ground: the planet earth itself. Land prices are daunting, and so can be the advent of agribusiness into the lucrative organic-food economy, but small, local farmers are reinventing the ancient art of tilling the soil, carving out niches in a complex market. College-educated, worldly wise and possessing high-tech savvy, these agricultural revolutionaries have introduced new varieties into the region, and they have resurrected old ones. Even the once regal apple has made a dramatic resurgence. Sally Graves and her husband, Mike-the president of the Marin County Farm bureau-grow a half-dozen different varieties of such heirloom apples as Pinova, Mutsu, Senshu, William's Pride, Molly's Delicious and Orin on their sprawling 600-acre ranch in the heart of rural Marin County. "It's sad to see orchards pulled out, but while others are pulling out, we're putting in," Sally says. "We sell every single apple we pick, and we've derived immense pleasure from our orchard. There's nothing as beautiful as an apple tree in blossom." Sally inherited Chileno Valley Ranch, a family-run enterprise since 1862, from her mother. She and Mike do the picking and pruning themselves. "We must be crazy," she says. "We're grandparents. In addition to apples, we grow pears; we're doubling the size of the orchard, and next summer we're putting in tomatoes." Sally calls the ranch "a hybrid," because the apples are certified organic and so are their pastures, while the cattle they raise are merely "grass-fed." They inoculate the herd against diseases, which means that the county does not allow them to sell beef under the organic label. But they treat their cows as humanely as cows raised for beef can be treated. "We enjoy a connection to our animals," Sally says. "The calves live here their whole lives and they're harvested here. A butcher slaughters and quarters three animals at a time. The meat hangs for two weeks and customers pick it up at the butcher shop." Today, growers not only raise the food we eat, but also, increasingly, provide a sense of place, a feeling of attachment to the earth, feeding the imagination as well as the stomach. Men and women with a hoe and seeds, hope and salesmanship serve as guardians of moral values in a world in which nothing feels deep-down rooted anymore. In the agricultural fields of the North Bay, I hear two constant refrains: "To own a farm in Northern California, you either have to inherit it or marry into it" and "Your farm will reflect your personality." Both seem true. Stan Denner, who is nearly 90, and who met the legendary Luther Burbank as a boy, is a fourth-generation Sonoma County rancher; in boots, jeans and cowboy hat, he's the iconic California cowboy. Bearded, bespectacled Lou Preston from Preston Vineyard also comes from a traditional farming family. He grew up on a local dairy, went away to college and came home to grow grapes. "I was seriously bitten by the grape bug and had grape blinders," Preston said at a recent panel at the Sonoma County Museum. Preston now grows prunes, apples, walnuts and olive trees. He shared the panel with Denner and with Rick Kaye, a self-described "wannabe farmer" who works as an education specialist for the Sotoyome Resource Conservation District, a local agency that lobbies on behalf of the environment and for sustainability. Kaye reminded the audience that two acres of farmland are lost every two minutes in the United States. Still, acres of farmland are also found and restored, and even outsiders like Kevin McEnnis occasionally acquire land on their own. After graduating from UC Santa Cruz and working in Guatemala for human rights, McEnnis settled in Sonoma County in the late 1990s. 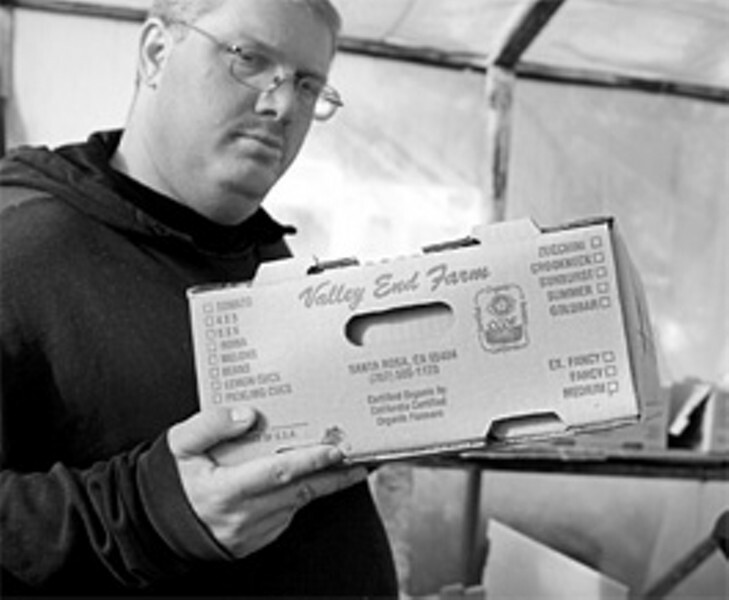 He leased land from the city of Santa Rosa and began to grow vegetables on 10 acres at Quetzal Farms. At first, he did all the growing and selling himself. Then he burned out and joined with Keith Abeles, who took over much of the marketing. They sell to Green Leaf, a major San Francisco distributor, and to Oliver's, Whole Foods and Fiesta markets. The bulk of their produce is sold in Berkeley, some of it grown to meet the exacting specifications of gourmet chefs looking for new, different tastes. "This is a weird profession to be in," McEnnis says as he stands in the middle of a field with a winter cover crop, a baseball hat protecting his eyes from the bright sun. "People have stereotypes. They expect 'Farmer John' in overalls." McEnnis and Abeles, who look more like Butch Cassidy and the Sundance Kid, pay $600 a year in fees to be certified organic. "We're found that the further away from the farm, the closer the relationships we have with customers," McEnnis says. "In Sebastopol, we're taken for granted. In Berkeley, where we have a cult following, they love us. They see our peppers and tomatoes, and say, 'They're beautiful.' In a way, we're fulfilling aesthetic needs." McEnnis and Abeles say that their farm is profitable, but they must borrow money every year. Like most, if not all farmers, they experience cash-flow problems. McEnnis adds to his income by teaching at New College. "I want the students to be able to grow their own food in keeping with ecological principles," he says. "I bring them to Quetzal and show them what we're doing here." He and Abeles have also taken their message abroad; as invited guests, they attended Terra Madre, a gathering of artisan food producers held last year in Turino, Italy, sponsored by the Slow Food movement. Nobody in local farming has the cash-flow problem solved as well as Scott Mathieson at Laguna Farms, which, surprisingly, is not organic. Mathieson has more than 400 supporters who belong to his community-shared agriculture program. For years, they have been the saviors of Laguna Farm, and they're proud of their role. Such subscribers will play a part in saving small, locally owned farms in northern California-if the locally owned farm, that endangered species, is to be saved at all. "We're blown away by these carrots," says Martha, a Laguna Farms subscriber who stopped by the place on a recent Wednesday to pick up her food. She was raised on a farm in the Midwest. "These carrots taste the way carrots taste in your wildest imagination." Barbara, who comes from Chicago and lives a mile from the farm, says, "We need to have farms close to home. This is the way we need to go in the future." Imgard Kern, who was born and raised in Germany, sums up the way a great many shoppers feel. "It's a political statement to buy from a local farm," she says. "I like to think it's spreading." Michael Traugot, a Ph.D. student in agriculture at UC Davis adds, "I like the fact that the produce here is not flown in or trucked from far away. I also buy here to help prevent urban sprawl." One shopper had a gripe about her bill. Maitreyi Siruguri, who grew up in South India and who supervises the pickups and payments, came to the rescue. She settled the account amiably and went on keeping the books. Mathieson used to run his CSA on the honor system, but that proved unworkable; cabbages, carrots and kale disappeared and receipts didn't add up. The only way to prevent produce from vanishing was to keep a sharp eye on it and, more recently, to hire Siruguri to mind the store. Laguna Farms has had problems since it started in 1986, but Mathieson maintains his utopian dreams. "Local is more important than organic," he says, standing in the sun, wearing clogs, baggy sweatpants and a fleece jacket with a button that proclaims, "Inner Peace Is World Peace." Mathieson doesn't hide the fact that his parents gave him the land and that he doesn't have a mortgage to pay. He doesn't hide his politics either. Some of what he says he's borrowed from the agrarian philosopher Wendell Berry. He quotes Berry's remark about putting culture back in agriculture, and over the years, he's done just that. In the summer of 2007, he'll operate the Earth Roots Field School to teach "sustainable living" and "nature awareness." "If you are what you eat, then what you put into your mouth is what you turn into," he says. "What you feed the soil is what you feed yourself." He's certainly driven, if not preoccupied, with his farm, but he's harvested wisdom, too. "I'm addicted to this lifestyle," he says. "But I don't want the farm to run me; I want to run the farm." Halfway across Sonoma County, directly east of Laguna Farms, a far different story unfolds at Valley End Farms on Petaluma Hill Road, near the foot of Sonoma Mountain. Valley End looks like the quintessential local farm; the rich, dark soil smells lovely after it's newly plowed, and men and women, not machines, do the harvesting. Sharon Grossi, who owns and operates the business with her son Clint, named the farm "Valley End" because it sits, literally, at the tiptop of a long, fertile valley. She didn't mean the name to be prophetic, didn't think she would live to see the end of farming in her valley, but it might turn out that way. A developer wants to build 1,600 houses across the road, Sonoma State University is expanding in her direction and the county is calling for more wetlands adjacent to Grossi's 65-acre farm. "They've got me squeezed, and I'm freaked," she says as she sits on the sofa in the living room of her sprawling, modern farmhouse, dressed in sweatpants and a sweatshirt. "Everyone loves the farmer, and everyone loves agriculture, but everyone, it seems, wants to live in Sonoma County, and that means more houses, more traffic, more people, more cars, more malls, diminishing water and fewer farms. I want to go on living and farming here, but I'm not sure how I'm going to do that." Farming has been Grossi's life. Raised by her parents on a ranch, she mended fences, milked cows and pulled heifers out of ditches. "Dad worked me like a man," she says. "I did boy stuff all through my teen years." She attended Cal Poly, studied agriculture and received a certificate to teach home economics, which comes in handy, she says, when deciding what crops to plant. As a young woman, she married a dairyman, reared kids, raised hay and ran the business end of the ranch before she divorced and moved away to start her own operation. No one seems to have the latest figures, but Valley End Farm is apparently the largest certified organic farm in Sonoma County. It is certainly the largest local organic farm owned and operated by a woman, and working in the largely male-dominated world of agriculture has not been easy. "Some San Francisco distributors seem to think that women are dumb and that they can cheat me," she says. "I have to stay on my toes." Grossi, who is known in the trade as the "Bean Queen," grows four different kinds of beans, plus garlic, spinach and tons of tomatoes. She makes a decent living, but she works hard-360 days a year-and paperwork on her desk and a computer constantly beckon. Now that big farms in the great Central Valley have converted from conventional to organic because it's more profitable, not for moral or political reasons, she finds herself squeezed at the marketplace. "Organic is mainstream now," she says. "It's not a niche product anymore. The change is driving the price way down. If the trend continues, it might put small and medium size growers like me out of business. Or else I'll have to reinvent the wheel." Last summer she started a roadside stand on Petaluma Hill Road and sold enough vegetables to make her want to expand. She'd like to have subscribers, and open a year-round store. If Rohnert Park or Sonoma State University would adopt her farm, she'd breathe a big sigh of relief. The farmworkers who work for Grossi seem happy enough, but organic farmers are not known to pay top dollar to laborers, and the law of supply and demand demands that they cut costs. Not paying minimum wage is one solution. If farming in northern California is to survive, it may depend on Mexicans like Leno, the foreman at Valley End. Born and raised in Oaxaca, he worked on a farm called La Pelita before he came to the United States and obtained a green card. "My whole family is here now," he says. "The opportunities are bigger here, and my own dream is to own a rancho. I have a heart for farming and I plan on growing organic. Not using chemical sprays is better for all of us. There's less of a chance of cancer." Growers who find a niche and work it efficiently also seem likely to survive the revolution in agriculture. Perhaps no local grower has carved out a niche more successfully than Joseph Minocchi, the quintessential hermitlike herbalist at White Crane Springs Farm, deep in the forest not all that far from the border between Sonoma and Mendocino. On a postage-stamp-size farm, fed by the freshest water around, he grows flowers, herbs and rare greens for "the elite," to borrow his own phrase. Minocchi uses no machines and no chemicals. He works seven days a week year-round and earns the bulk of his income from his 20 ingredient "Wild and Herbal" salad mix, featuring burnet, chickweed, mache, sorrel, purslane and mallow that he sells for $30 a pound. He ships the mix in special containers that preserve its freshness to gourmet restaurants in Las Vegas, and he delivers it by hand to the Saturday farmers market at San Francisco's Ferry Building. "I'm beyond organic," Minocchi says on a cold winter day when the ground is covered with frost and the sun doesn't shine on his land. "I'm biodynamic. When I started, I didn't want to grow the same things that everyone else was growing. I didn't want to grow lettuce. It's too common. So I raise tulips and watercress, which I sell for $30 a pound, and that Alice Waters loves. Once anybody tries my Wild and Herbal mix, they're hooked, and it's good for you, too. It tastes wonderful and it's medicinal, too." He holds out his hand, his palm filled with fresh herbs, and smiles. "What more could anyone want?"